We believe no child should be part of war. Ever. Children have the right to grow up in peace, free from fear and violence. To develop their full potential and become the person they want to be. Together we can change the future. War Child makes a lasting impact by protecting children from violence and providing psychosocial support and education. We unleash children’s inner strength with our creative and involving approach. We inspire as many people as we can to participate in our cause. War Child’s ambition is to reach beyond its own limitations by actively collaborating and sharing its approach with as many other organisations working with and for children in conflict areas as possible. Through collaboration, War Child will not only be able to reach more children, but will also be able to reach children who would be otherwise ‘unreachable’. 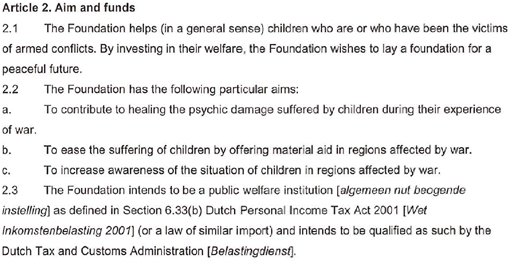 War Child’s Articles of Association officially state our aim and funds.